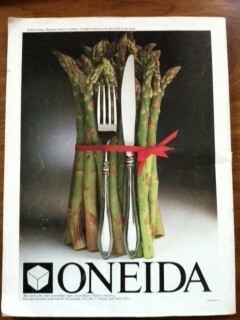 This ad for Oneida silverware is from a 1974 Gourmet magazine. Can you tell? Around that time the company was developing a flatware line made of sterling. It was affordable yet elegant enough to be displayed among the true silver sections of high end department stores. Savvy entertaining for all! The company has some pretty interesting roots, the tales of which I was introduced to by a sweet friend who grew up next door to the Oneida Community Mansion House in the Central New York city of Oneida where it all began. There, a man named John Humphrey Noyes founded a utopian society centered around religious notions such as perfectionism and communalism. Unusual sexual and breeding practices were custom. Members resided in the Mansion House together as a very large family. Sounds like an American version of a scene from an Ayn Rand novel! As a means of sustainability, the people of Oneida produced furniture, traps, hats, mops, silk and other household goods, including silverware. In 1880, toward the end the community’s run as a cohesive society, Oneida Limited was formed. The enterprise continued on to become one of the highest quality, and most ubiquitously used producers of flatware in the world. Everything comes from something, you know? Just a little tidbit to consider next time you polish your spoons, cut your quiche, or set the table à la française (name of the utensil brand facing up, spokes facing down, a less aggressive style of table setting, preferred by the French).